This article provides a step-by-step process for using the RAINstream software on the ThingMagic Sargas reader. ThingMagic RAINstream is an optional, licensed on-reader software application that simplifies data integration, and enables the integration of the reader into existing systems. With RAINstream, tag data can be sent to a back-end processing system using any of several protocols including TCP, HTTP POST, a serial connection, emulating a keyboard, or to a file on a USB drive. To install RAINstream on the Sargas reader, first access the reader's Web UI. 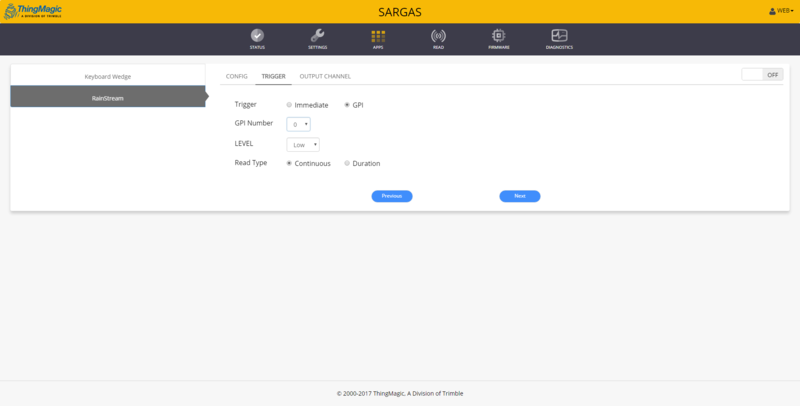 This can be accomplished by following the steps in Setting Up Your Sargas Reader. Once the Web UI has been accessed, navigate to the Apps tab and select the RAINstream option in the left-hand toolbar. Once this option is selected, you will be prompted to enter in the license key for RAINstream. Once the license key has been entered, select Update License to install RAINstream onto the reader. 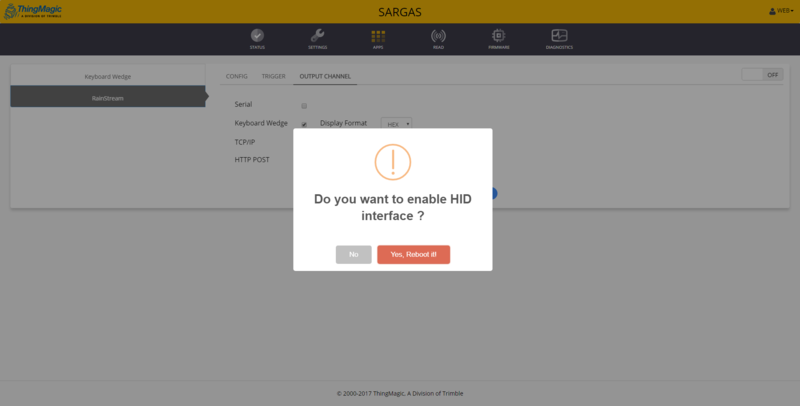 If the license key is valid, the Sargas reader will reboot and activate the RAINstream software. Once the reader has rebooted and RAINstream is installed, you may be prompted to log in to the Web UI again. Once logged in, navigate to the Apps tab again and select the RAINstream option. RAINstream can be configured using the three tabs listed in the menu: CONFIG, TRIGGER, and OUTPUT CHANNEL. The CONFIG tab allows the user to customize the format of the tag data being reported, and allows the user to choose which fields will be reported. The TRIGGER tab allows for the configuration of the reader's input triggers. When set to "Immediate", the reader will begin reading tags as soon as the reader is booted up. The "GPI" option allows for the reader to wait for an input signal before beginning a read session. The "GPI" option allows for further configuration, such as the GPIO port to listen on and the level of the signal to accept as a trigger. The OUTPUT CHANNEL allows for the customization of the output method for tag reads. The tag data can be output as a keyboard wedge, via a serial connection, or via TCP/IP or HTTP POST protocols. NOTE: Once all of the settings have been configured for each OUTPUT CHANNEL option, save the settings by selecting the "Save" button, and then select the "OFF" switch at the top right of the menu to turn RAINstream "ON". 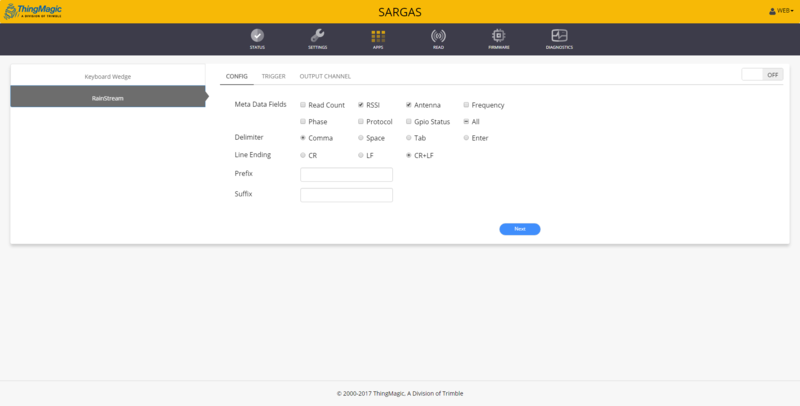 To receive tag data from the reader via a serial connection, you will need to connect a USB cable from the reader's USB1 port to your PC, which will install the Sargas device onto your PC. Once installed, you should be able to locate the device in "Devices and Printers" and view its Properties to see the COM port assigned to it. In RAINstream, select the "Serial" option and choose the COM port and Baud rate for the connection. Select "Save" once the desired settings have been configured. NOTE: Since the Sargas is a Linux-based device, the COM port listed on the Web UI will be different from the COM port listed on your PC. 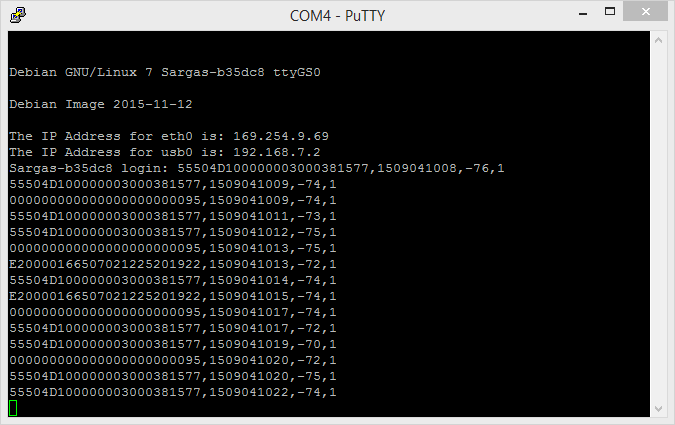 Using a serial communication software such as PuTTY, connect to the reader using these settings and view the tag data as it is reported. 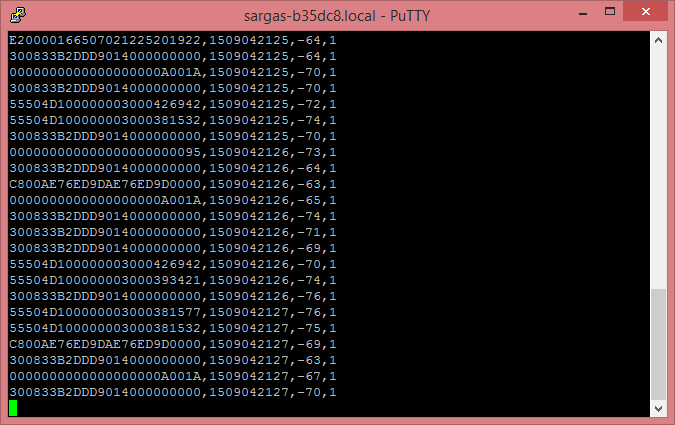 In PuTTY, be sure to use the COM port listed by your PC, not the one listed in the Sargas Web UI. To utilize the Keyboard Wedge functionality, the reader will need to be connected to a PC via the USB1 connection. Select the "Keyboard Wedge" option in RAINstream and select "Save". Once this is done, the reader should prompt you to restart the reader and activate HID mode. Once the reboot has completed, the reader will begin transmitting tag read data to the PC as an emulated keyboard. For this example, I opened Notepad and let the reader populate the file as it read. 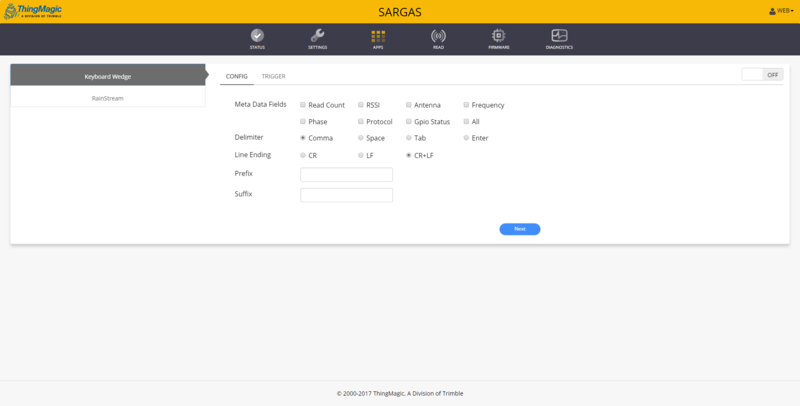 In PuTTY, select the "Telnet" option and enter the hostname of the Sargas reader, which can be found in the address bar of the Web UI. Enter the correct port number and open the connection. Once the connection is successful, the reader should be reporting data into the resulting terminal window. For this example, we will use the HTTP POST functionality and post the tag data to a known URL. Select the "HTTP POST" option and enter the desired URL and update interval for the POST. Once the settings have been saved, the reader can be disconnected from the PC and connected to a network port via the ethernet cable. 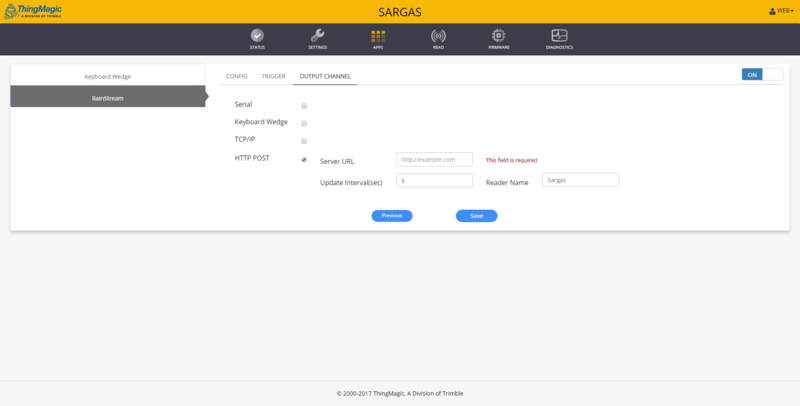 If the network is configured correctly, the Sargas will begin to post tag data to the specified URL at the selected update interval.